I’ve been in Canada for a couple of weeks at this point, and it’s a lazy Saturday. I’m strapped in the back of a CRV with a toddler. We’re listening to The Tragically Hip. A hearse rolls by us on the 401. We’re headed to St. Lawrence Market. 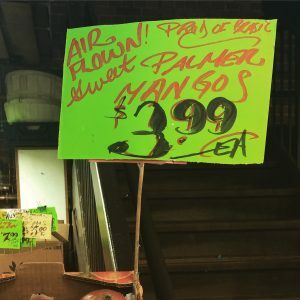 St. Lawrence Market: Think Quincy Market in Boston. Pike Place Market in Seattle and Grand Central Market in LA — all rolled into one big, sweaty plaid Canadian free-for-all. They got fruit. They got gourmet cheese. Kitchen doo-dads. Tiddlywinks. Mustards. Meat. Fish. Butter tarts (that’s for later). Peameal Bacon is Canadian Bacon, and “Canadian Bacon” isn’t a thing. This is where I had my first “Peameal Bacon Sandwich” from the Carousel Bakery. 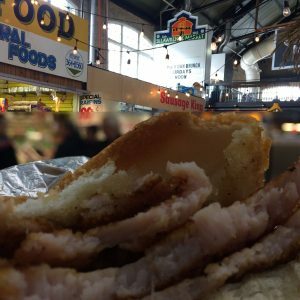 A Peameal Bacon Sandwich is a simple country style sandwich roll embracing a generous portion of griddled, wet-cured, pork loin rolled in cornmeal. 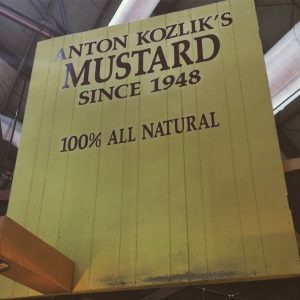 Mustard. The pork’s not greasy or fatty, just juicy and lean. It’s not a ham sandwich folks — it’s a tender kiss from a thin slice of pork chop (with some beard-burn). The whole “Canadian Bacon” thing we eat in the States isn’t something people recognize here. “Canadian Bacon” is sad ham. Peameal Bacon is pork that decided to clear the Yukon. Mere hours before I had no idea this form of bacon existed. I’ve been a fool. It’s not that Canada kept a secret, it’s that Americans took the wrong bait. We said, “Ew. I don’t want a fuzzy layer of corn stubble on my pork!” We were wrong! My eyes are open, and today I am alive in Canada.